Total cost of 14 day trip – per person. Maximum 10 travelers for the trip. The Max Grover Painting workshop is included (maximum 8 students). 13 nights hotel (not incl. room service, laundry, etc.). Tuition for 3-day Painting Workshop with Max Grover (materials not incl.). Saigon puppet show & river cruise (dinner incl., not drinks). All group ground transportation, domestic flight(s). Guides/entrance fees to War Remnants Museum and Independence Palace. Sophie’s HCMC Art Tour ½ day (or similar). 3 day/2 night Mekong Delta Tour (hotel + all transport incl.). Most breakfasts (when included with hotel), 2 lunches, 2 dinners. 1 pre-arranged 30-day single-entry tourist visa for US citizen to enter Vietnam (other types also available). Welcome group dinner in HCMC. 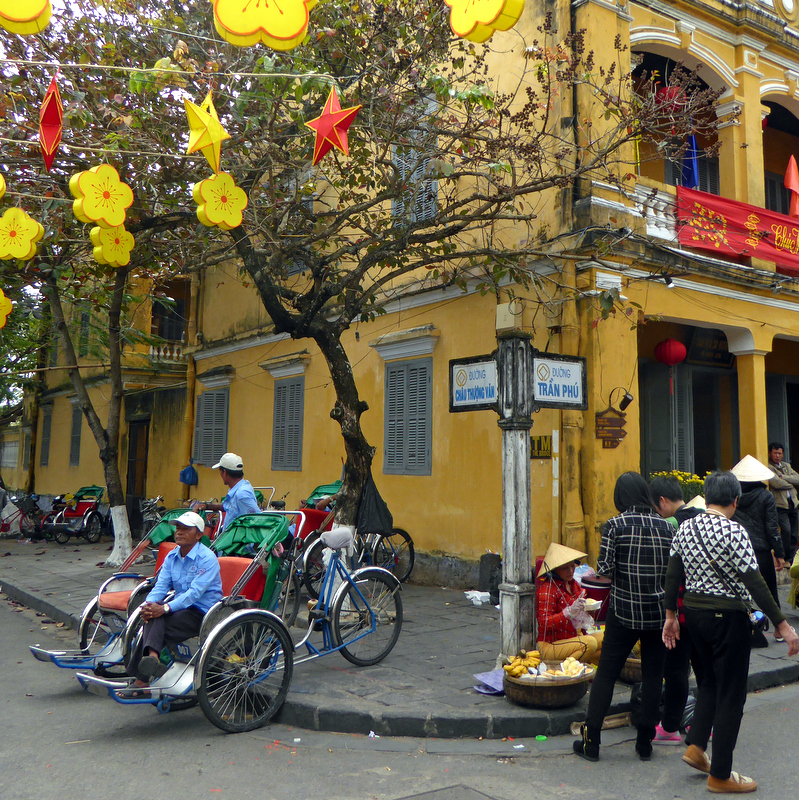 1 entrance ticket to Hoi An Old Town = allows entrance to 5 historic sites downtown. At least 2 pre-trip Q&A meetings in Port Townsend. Unlimited pre-trip email and phone support to help travelers prepare. 4 nights at Duc Vuong Hotel in Ho Chi Minh City—a 2016 Agoda Gold Circle Award winner for hospitality. Guests will stay in a Superior Room or greater. 7 nights at the Ha An Hotel in Hoi An ( )- a 2016 Tripadvisor “Certificate of Excellence” Award winner. Guests will stay in a Superior Room or greater. 2 nights at Muong Thanh Luxury Can Tho Hotel while in Mekong Delta. Guests will stay in Deluxe Double Room or greater. International flights are not included in this offering so participants are responsible for getting themselves to HCMC on or about Nov 1st. (Please note that due to flying over the international date line on your way to Vietnam, one whole day disappears, so you’d want to leave on Oct 30th to arrive on the Nov 1st. Conversely, you gain a day on your return.) Please contact Dan if you’d like any advice on airlines/routes/stopovers/layovers/tips. International airfare to VN and back from USA (currently approx. $550 rt from Seattle). US travel to/from your departure airport. Personal/individual travel insurance with MAJOR MEDICAL (required). For cancellations 15 days or more before Nov. 1, one third of the fee will be forfeited. For cancellations 7 to 14 days before Nov. 1, two thirds of the fee will be forfeited. For cancellations 7 days or less before Nov. 1, the full fee will be forfeited.